Prepare for a voyage of undersea discovery at Atlantis Marine World. The only public Aquarium on Long Island, Atlantis Marine World offers interactive fun, adventure, and education. Visitors are invited to take a Shark Dive, snorkel with tropical fish, feed a stingray, watch a sea lion show, and more. Itâ€™s all waiting for you at Atlantis Marine World, in Riverhead, New York. 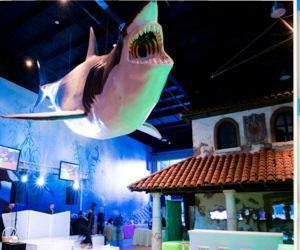 Atlantis Marine World is also available as a banquet and events center for weddings and special events. Visit our website for more information about our exhibits, upcoming special events and coupons! I don't say this lightly - but this is one of the best aquariums I have ever been to. It's expensive, but you get soooo much for your money. And when I say it's expensive, I really mean that it's expensive if you want to pay extra to do extra things. But that's why this place is so great. You can choose from tons of cool activities. I didn't even know about it until my kid had a sleepover field trip there. Pretty strange notion I thought, sleeping over at an aquarium, but the kid in me definitely could see the appeal. When she came back and told us all about feeding the stingrays, we just had to go and check it out as a family. If you ever get a chance to pet or feed a sting ray, you should do it! They are as soft as velvet and as friendly as the sweetest puppy dog. Who knew that they were such social critters? When I had some money saved up, I went and did the shark dive. It was $140, but so worth it. I have loved sharks my whole life - they are truly amazing creatures. The shark dive puts you in a cage surrounded by like a dozen sharks! We also did the "sea lion kiss," which our daughter really wanted to do. It was ridiculously cute, and so is our keepsake photo. We've all done the snorkeling with the fishes too. This place is FUN and it's educational. If you are crazy about sea life, you can't miss it. Atlantis Marine World is a lovely place to be in. You can snorkel with the fishes and feed them too. If you take your kids along, they would be happy with whatever they’ll get to see at the Atlantis Marine World. Overall, a big thank you to their services! Atlantis Marine Head is a suave place to be in. I particularly enjoyed snorkeling and diving with the fishes. They are so colorful and beautiful that you never want to go out to the surface. I remember my kids creating a ruckus on the boat and the patience the staff showed in handling them so that we could have a good dive. Overall, this company deserves five stars! I am going there again – when my boys are old enough to participate! The best tourist destination in Long Island. I’m definitely going there again. Snorkeling with fish was so exciting for us at Atlantis Marine World. There was so many other things to do, we're going to have to go back again in order to do everything there is available. Visiting Atlantis Marine World is one of my families favorite things to do. There are so many things to explore and learn about that you can't possibly do it all in one day. My kids favorite thing is to watch the sea lion show, they just think they are so adorable. You have to check things out for yourself as I could go on all day about everything there is to do. Do you have any experience using Atlantis Marine World? If so, please rate your experience and let others hear about it using the form below.